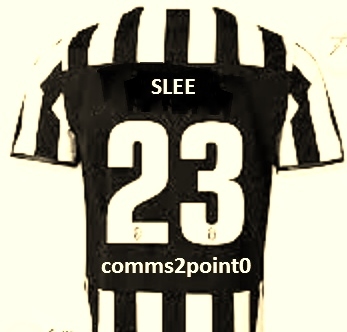 As the transfer deadline day window gets ready to slam shut, I’m delighted to be able to announce our first big money, foreign (to Tyneside anyway) Premier league, star signing to NE comms conversation FC. Word of our North East comms conversation has spread beyond the region and reached some of the champions league big boys. In true David Craig style I’m delighted to be able to boisterously introduce one of my favourite bloggers Dan Slee from Comms2point0. For those who don’t know http://www.comms2point0.co.uk is the go to website for thought leadership around communications in the public sector. For me it’s the must-read source of information and learning for the sector I work in. To stretch the local football metaphore even further he’s even able to boast some local Geordie credentials having spent his uni years in the toon. I really hope you’ve enjoyed all the blogs so far and I want to say a massive thank you to everyone who has contributed to a great conversation about our industry in the North East. Because I would never ask people to do anything I wouldn’t do myself, I’ve had a go at answering some of the questions that I’ve been pestering everyone else with. I’ve strapped myself down, adopted an aggressive tone, turned on the interrogation lamp (normal weekend stuff really) and tried to add my ten pence worth to the debate. Rachel McBryde is the Business Development Director at Gardiner Richardson. It’s great to get the views of someone so senior at one of the region’s top PR agencies and add more to this conversation about communications in the North East. There are some fantastic tips here for people looking to break into the industry as well as some great commentary on how PR is changing. As Head of Communications at Nexus Huw Lewis regularly tackles some of the biggest issues in the media. Transport is a huge issue across the region and the Metro is firmly part of North East life. Next up it’s the lovely Sharon McKee. You know the format by now…..
Digital’s impact has changed so much, not least the power and presence of more traditional media like local newspapers. I’ve known and worked with Helen Fussell for a few years – in fact we’ve sat through some long, corporate meetings trying to keep ourselves awake more than once. Here’s her take on the North East comms industry…. Stuart Mackintosh spent nine years in journalism, including a spell as Chief Reporter at The Northern Echo, before moving into communications in 2006. He has had two spells in North-East local government comms – either side of two years as a consultant – and is a former winner of the CIPR North-East Outstanding Young Communicator award. I’ve admired his work (and excellent blogging) for a long time and now he has his say on the North East comms scene….